Undergoing an enterprise resource planning (ERP) implementation deployment can be full of highs and lows as your company anticipates the changes that will occur in your existing workflow. The key to handling your staff’s expectations is effective planning, precise job related training, timely mock live experience, anticipation management and scheduled follow-ups. Your upcoming implementation should include erp templates catered to your industry and staff skill level. Utilize these templates to understand how your workflow will be impacted and how to be proactive with the impending changes. Work on custom feasible solutions instead of dwelling on what is changing. 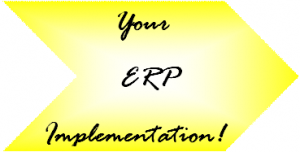 Whomever you select to do your ERP training, make sure it is customized to your needs. Your vendor should have experience in your industry and not try to fit a canned solution over your impending deployment. This solution should include specific job related training so your staff will know what to expect once your go live is determined. If possible, try to do a mock live so you employees can “experience” their new platform prior to go live. This will assist help your staff by giving them hands-on experience as a team. This mock live experience will allow them to see first-hand how this new software will affect their job as well as their co-workers. Another essential key to an effective ERP deployment is anticipation management. Your staff should know exactly how their jobs and tasks will be changed. Training should include a cross reference of what your staff did prior to the deployment and what to expect after this change has occurred. Your ERP deployment should include scheduled follow-up and support. On your go live day, try to have an expert on-site to handle the opportunities that will occur. This will give your staff the support they need in this stressful situations. Make sure this expert allows your staff to use their skills learned in training to resolve their issues instead of the just letting the expert “fix” the problem.